When it comes to staying warm on a hunt, proper insulation is key. Check out our collection of the best outerwear for 2017. The KnockOut suit from ScentBlocker is an early-season best seller, and for good reason – these garments are quiet and lightweight, with micro-wicking XLT 4Direction stretch fabric. The KnockOut also boasts ScentBlocker’s Trinity scent-control technology to get the wearer even closer. The full-zip KnockOut Jacket features one chest pocket and two lower pockets; the Pant offers two cargo pockets, one rear snap pocket and two inset waist pockets. Available in sizes M-XXL, the KnockOut is perfect for early hunts, or for layering later in the season. Independent retailers will love that the KnockOut is part of ScentBlocker’s Back to Main Street program and is a dealer-exclusive item. ScentLok is a heavy hitter in the hunting-apparel sector, and it adds the feature-rich Full Season Taktix Jacket ($150, S-XL; $160, 2X-3X) and Pant ($150, S-XL; $160, 2X-3X) to its already impressive lineup. Taktix garments incorporate Carbon Alloy technology for odor adsorption, and a NeverWet coating effectively repels water and heavy oils. A micro-tricot outer fabric ensures silence while moving, and a wicking treatment manages moisture. The Taktix Jacket includes an NRA-approved sidearm chest pocket, and a safety-harness opening further expands its function. The Taktix Pant has an inner-thigh gusset and articulated knees to improve mobility. Technical overlay color panels add a nice touch to both garments. Combined, the Taktix Pant and Jacket make one deadly combination. Hard-core hunting requires hard-core gear. Sitka Gear’s Thunderhead Jacket ($329) sheds water like a duck with a Gore-Tex laminate water barrier and brushed polyester knit face. The soft jacket is supple and quiet to promote comfort and stealth. The drop-away hood is perfect for nasty conditions, and zippered pockets protect your gear in transit. The Thunderhead Pant ($269) perfectly complements the jacket. It features the same brushed polyester fabrics and Gore-Tex Laminate barrier, providing all the protection you need when the weather turns sour. Both garments are offered in Sitka’s Subalpine camo pattern. Also new to Sitka’s line are the Ascent Shirt ($169) and Pant ($189), which feature Polygiene Odor Control Technology. It uses naturally occurring silver salt made from recycled silver – a highly effective antimicrobial agent that safely inhibits odor-causing bacteria and fungi from growing throughout the product’s lifetime. Badlands launched the Hybrid Jacket ($250) and Pant ($250), which feature ultra-quiet, water-resistant softshell construction and HexLite fleece interior for warmth and comfort in variable bowhunting conditions. The garments feature Teflon Shield to repel water and stains. The jacket boasts compressible sleeves tailored specifically for bowstring clearance, and its windproof properties are sure to keep you cozy. The pant offers Keprotec reinforced knees and cuffs to strengthen common wear spots. Knee-high boot zippers ensure an easy-on, easy-off design. 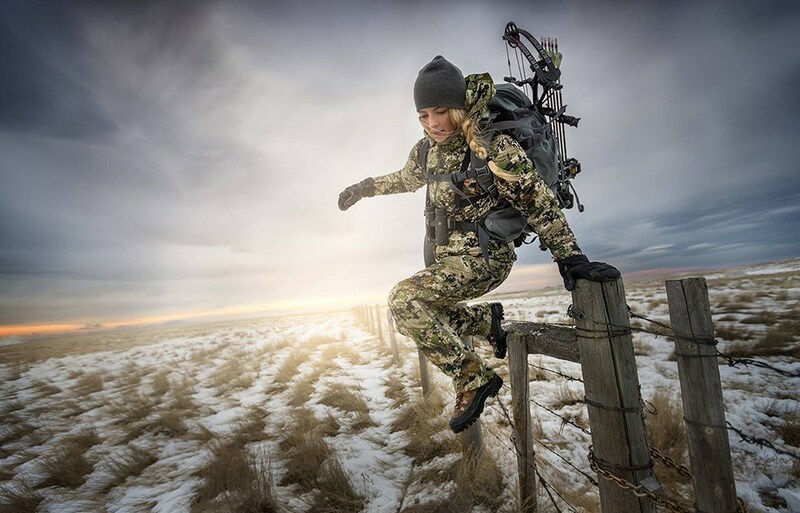 Both garments flaunt Badlands Approach camo and are backed by Badlands’ Unconditional Warranty. Browning’s Hell’s Canyon apparel line has been revamped to include new fit, fabric and construction. High on the list is the Hell’s Canyon Mercury Men’s Jacket ($170) and Pant ($150), which feature Addvanced Scent Control in a woven water-resistant fabric. A safety-harness slot, zippered hand-warmer pockets and a full-length zipper with chin guard are just some of the jacket’s attributes. The pant features hip pockets with abrasion-resistant fabric overlays, rear pocket and a 22-inch side-seam leg zipper. The garments are available in Mossy Oak Break-Up Mountain Country, Mossy Oak Break-Up Country, Realtree Xtra and solid capers color in sizes S-3X. UA Threadborne Wool is the secret behind Under Armour’s UA Mid-Season Wool Jacket ($250) and Pant ($225). It regulates temperature to keep the wearer warm in cold temps and cool in warm temps. It’s also specially engineered to be exceptionally durable and to have plenty of stretch for enhanced mobility. Additionally, the wool is unbelievably quiet in motion. The jacket is harness-compatible, and scent-control technology helps you hunt more effectively. The pant features durable canvas scuff guards, and 22-inch side zippers complete them. Rocky expands its Stratum collection, which features highly effective Venator camo. The Stratum Waterproof Jacket ($140) and Pant ($130) are 100 percent waterproof with taped and sealed seams, and feature a DWR exterior coating for protection from the elements. Rocky’s ScentIQ Atomic technology destroys human odor at the microbial level. SilentHunter suede fabric is designed with superior moisture-wicking qualities, and it offers complete silence. Kryptek’s new Vellus Jacket ($170) offers innovative laminated fabric that will change the way you hunt. Vellus fleece combined with Thinsulate Platinum XTS Insulation means you’ll be dry, quiet and comfortable between 15 to 50 degrees F. X-static silver fibers require no recharging and are permanently embedded in the insulation for scent control. The Vellus Pant ($160) boasts zippered pockets and leg zippers for simplified on-and-off convenience. Both garments feature Kryptek’s ultra-versatile Highlander camo. Affordability and performance collide in Treezyn’s LSB Field Jacket ($85, M-XL; $87, 2X-4X). The lining retains heat while the micro-fleece is whisper-quiet and soft. Store your accessories in deep waist pockets and a deep chest pocket. Wrist cuffs are Velcro-adjustable for a perfect fit, and a waist-band drawstring keeps the garment close to your body for an athletic fit that won’t encumber mobility. ASAT Outdoors now offers the new and improved G2 Essential Pant ($130). Constructed from ultra-quiet microtex material, it features an athletic cut and articulated leg seams so you can move freely without encumberment. This helps you bend, kneel or crawl across rough and barren topography like an athlete. Additionally, a lotus nano barrier repels water to keep you dry as you walk through dew-coated grass or weather out a light drizzle. Also new to the ASAT lineup is the Highwood Hoody ($130). It’s a mid-weight, long-sleeve layer with a half-zip design made from two-layer bonded fleece for amazing comfort with moisture-wicking qualities to keep you cozy during long days afield. The Highwood Hoody doubles as an effective outer garment during mild temperatures. At the ATA Show, Sitka Gear announced the launch of its new women’s line. The company brought in a number of female designers and bowhunters to ensure that the garments met the exacting demands of hard-core female hunters. The result is a line of lightweight, premium-quality garments designed to truly fit women of all sizes. Available in sizes S-XL, the women’s line includes pants with inseams ranging from 25 to 33 inches in 1-inch increments. GroundShield Technology reduces heat loss. Sixteen items comprise the lineup, with whitetail garments available in Sitka’s Elevated 2 pattern and big-game garments in the new Subalpine pattern. ScentBlocker offers women the versatile Sola WindTec Jacket ($110) and Pant ($100). Aptly named, the Sola WindTec is equipped with ScentBlocker’s exclusive WindBlocker membrane, which is bonded between the fabric layers to deflect wind and help the user tough out blustery conditions. Micro-denier Hyperfleece maintains core heat and manages moisture to maximize comfort; plus it’s ultra-soft and quiet so you can remain undetected during windy days when game animals tend to be flighty. ScentLok’s sure-to-be-popular Taktix Jacket and Pant is also available for women. The W Full Season Taktix Jacket ($150) and Pant ($150) offer the same great technologies as the men’s version (Carbon Alloy technology, NeverWet coating, ultra-quiet micro-tricot outer fabric and a wicking treatment for moisture management) but with stunning turquoise accents and contours designed specifically to fit a woman’s body correctly. What’s up now, guys? New for 2017 from Browning is the Hell’s Canyon Mercury Women’s Jacket ($170) and Pant ($150). Water resistant, windproof and breathable, these garments are constructed with a mid-weight soft shell, fleece lining and triple-layer insulation, and designed with an athletic cut. Addvanced Scent Control keeps game-busting scent at a minimum, and convenient pockets keep gear at hand. The Mercury Women’s line is available in sizes ranging from XS-2XL. Warmth, comfort and a great fit. That’s what Under Armour’s UA Mid-Season Wool Jacket and Pant offer female hunters. Like the men’s version, this line features quiet, temperature-regulating Threadborne Wool, all in garments designed to meet a woman’s needs. This article originally appeared in the Archery Business April 2017 issue.